Congratulations on 100 fantastic challenges, ladies…and wishing you many, many more! Here are this week’s throwdown challenge colors, so you can celebrate and play along, too! 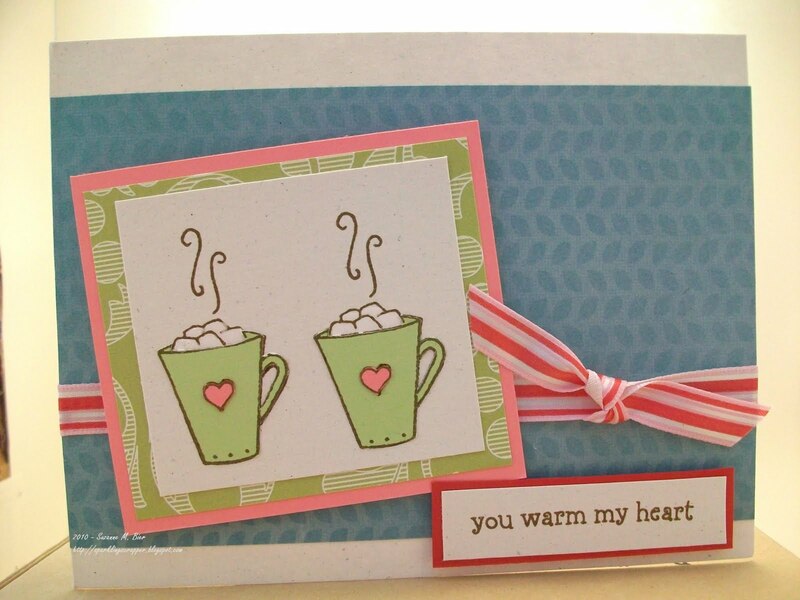 Even though it’s summertime, and most of the country is feeling the heat, my card features a different kind of warmth…hot chocolate! Of course, it’s more of a fall or wintertime image, but it was too cute to pass up for this week’s challenge! The paper that I used is from KaiserCraft and American Crafts. I also used Stampin’ Up Cardstock in the challenge colors. The ribbon is by ki Memories, and the stamps are by Elzybells Art Stamps. Thanks very much for looking…I hope you’ll celebrate with the Color Throwdown, too! sweet!! !Thanks for taking part in this exciting 100th Color Throwdown Challenge…..don't forget to hop around to all the blogs and leave some love…that will increase your changes of winning!! Your card is too cute! I love the background along with those 2 cups of steamy goodness! Thanks for playing along with the CTD! Very cute! Thanks for helping us celebrate this week! Ah! That's close enough to coffee for me! What a cute card! Thanks so much for helping us to celebrate our 100th challenge! Yummy!!! I love these images–such a sweet card to celebrate the 100th challenge! Sweet! This is so cute! Thanks for playing the 100th CTD!